Despite the South African Constitution guaranteeing socio-economic rights and explicitly recognising that everyone has inherent dignity, every day, millions of South Africans are denied constitutionally guaranteed rights through ineffective service delivery by the state. 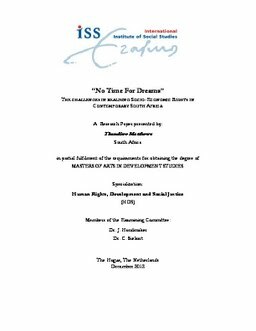 The objective of this research was to therefore explore the factors that limit the realisation of socio-economic rights, focussing on the implementation of a basic sanitation policy in the informal settlement of Makhaza, Khayelitsha, Cape Town, as an example exposing these limitations. While the right to basic sanitation is not explicitly mentioned in the South African Constitution, due to its personal nature it is intrinsically linked to the right to dignity. This research has sought to argue that a multi-dimensional approach should be adopted when analysing the challenges that inhibit the realisation of such rights. A three-tiered approach was adopted to analyse the Makhaza case-study: namely, a socio-legal approach, theories of citizenship and Black Consciousness. The research has further sought to argue that factors that inhibit the realisation of this right include aspects of power politics, and a lack of engagement between actors including politicians and civil society, which impacts on both policy implementation and the claiming of rights. The principal conclusion drawn was that successful judgments confirming socio-economic rights alone are not enough to ensure that citizens receive the rights they are entitled to – making use of both the courts as well as grassroots strategies outside of the court arena are required to realise rights. Further, communities are calling for policy-implementers to include them in decision-making processes that directly affect them, in addition to meeting their basic needs as a matter of urgency. A failure to achieve constructive civil-state engagement will result in the values embodied in the Constitution remaining but a dream.